Scripture makes it clear. The only way we become part of the church of Jesus is through an affirmative personal response to His call upon our lives; to accept personally by faith God’s message about Him as the Son of God sent to save us; receiving Him as the only One who saves us from our sin, the only Lord of our lives, trusting in Him to save us through His ‘finished work’; His suffering and death in our place and His rising again from the dead to provide us with eternal life. When we respond to Him personally by faith in this way, we are promised, not only the forgiveness of our sins, but also His Spirit to live in us, giving us new life and empowering us to live for Him. The Spirit’s coming and residing in the believer seals us, making us forever His (Eph 1:13,14). So, church membership in this sense could be said to be instantaneous and automatic. In another sense, however, it is more of a process. The reason for this is important. The term ‘church’ is used in two different senses in Scripture. In the first sense, there is only one Church – the Church of Jesus. But then there are churches. These are local manifestations of the universal body of Christ (see for example Acts 14:23). To become part of His church in the universal sense, one need only respond to Christ. But to join with a ‘local church’, something that is clearly taught in Scripture, there is ‘the human part’. You might say that God has a huge ‘advantage’ over us (understatement!) in that He knows everything, including all that is going on in our hearts. We, on the other hand, have to process things differently. Our relationships with one another depend upon verbal communications and interactions which involve expressions of commitment and trust. In much the same way that a marriage relationship involves a formal process, local church membership involves commitment, baptism and instruction (Matt 28:19,20). 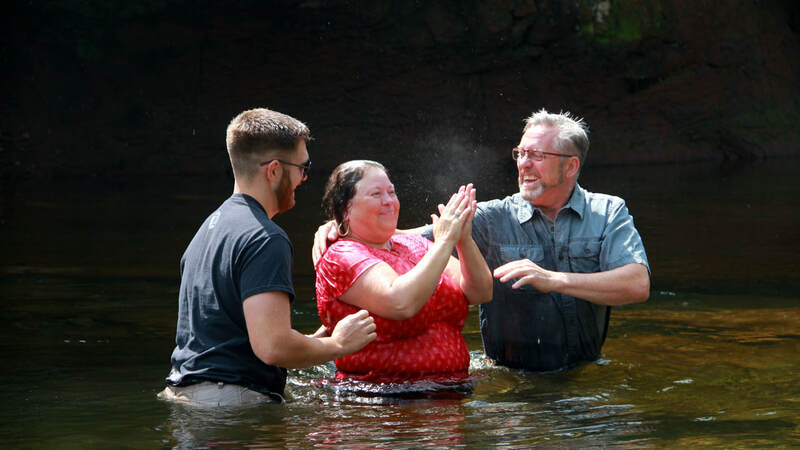 ​From the very beginning, local churches have followed the instruction of Christ in using water baptism to identify individuals with the local church body. Water baptism is a ceremony where professing individuals are publicly immersed in water as testimony to their personal faith in Christ and His death for them, and their intention to live a new life for Him. As such, water baptism becomes a vital part of the process of formal local church membership. ​The instruction part is also vital. Establishing a time for the ordered learning of new believers enables the church to ensure that each one has a good understanding of the gospel by which they are saved and the assurance they need to live freely and fully for Him. It provides the church the opportunity to instruct each one in the foundational teachings of Christ for their lives, and what is involved in being part of a local church. One of the truly great opportunities for new people in all of this is to learn all about the church they are becoming a part of. This is extremely important. The mutual accountability, interdependence and appreciation of these relationships serve to make for strong bonds between Christ followers. And this reality is emphasized throughout the New Testament over, and over again, continually (see for example 1Cor 12:12-27). Furthermore, functional church membership consists of the relationships we have with one another in Christ as His followers for life and for mission. Being on mission together involves cooperation. It requires a mixture of benefits and responsibilities (expectations). And the only way these things can work well is when they are clearly communicated, understood and agreed upon. And this necessitates some type of process. So, a formal membership process serves a very important purpose if a local church is going to be strong on mission together for Christ. The culture of individualism we are steeped in produces ‘push back’ in our day against a formal church membership process. We don’t generally like to be accountable to others. We don’t like to have to depend on others either. We may want to think that matters are always only between us and God, and no one else’s business. But that is clearly not the way God has established His church. Though we are ultimately accountable to God, we are also accountable to one another. This is a fact of Scripture (see for example Acts 20:28-38; 1Thess 5:12-24 & Heb 10:24,25). So, we find that there is great purpose and value in a formal, structured church membership process, and we have designed just such a process. It is purposeful, practical and biblical. It is something that God has used to build a stronger church for Himself as we live on mission together for Him in this world. And we trust He will continue to do so. ​What about you? Are you a committed member of the local body of Christ? You should be. If you’re not, you’re missing out on the opportunity of a lifetime - to be an active, visible and vocal part of the local body of Christ. Declare your allegiance!